The Capricorn Baby may appear slow and uninterested, but they are simply taking time with things, learning lessons slowly, so as to learn them well. Children born under this sign are practical, serious, determined and reward-oriented. When it comes to learning, don’t rush your child, but allow them to follow their own pace of discovery. Capricorn children are responsible and willing to work hard at their own pace for the results they seek. 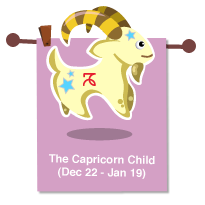 Encourage your little Capricorn with approval and practical, goal-oriented rewards.